If 2 axes of rotation are required, then 2 electric motors are required. To distinguish them in the drawing one engine is green and the other is pink. The purpose of the pink engine is to generate a very strong gyroscopic effect, so strong as to be almost inflexible. 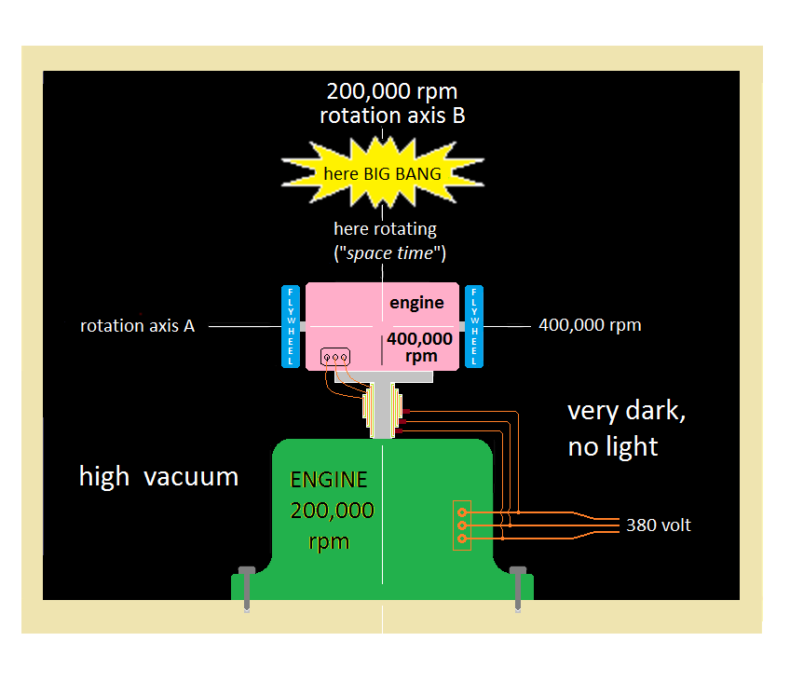 The purpose of the green engine is to quickly rotate the rotation axis produced by the pink engine. 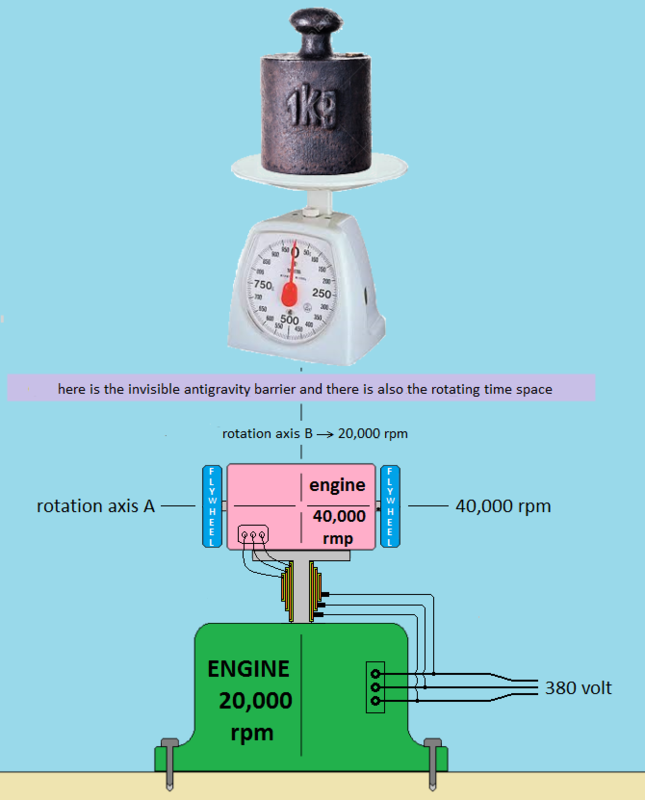 The effort to make the green engine is gigantic because the gyroscopic effect generated by the pink engine is gigantic. The pink engine must perform 400,000 rpm, instead the green motor must perform 200,000 rpm. Both engines must be inside a room where there is high vacuum, and also there must be a temperature of a few degrees kelvin: 1 or 2 or 3. The fans of the engines can not cool the engines because as already explained above, in fact inside the room is not air because there is an extreme vacuum. Although the fans can not cool the engines, the windings do not heat up because a few degrees kelvin triggers the strange phenomenon called "superconductivity". Superconductivity allows you to create very strong magnetic fields and the green motor provides a huge torque, able to overcome the gigantic gyroscopic effect. I remember that the gyroscopic effect has the tendency to keep the axis of rotation fixed in space. The gigantic pair generated by the green engine should generate heat or potential energy, but it does not generate any of the 2 forms of energy, so it seems that the famous law of energy conservation is not respected. In fact: in order for the law of conservation to be respected, it must necessarily happen that the ("space_time") that is above the pink motor must start to turn on itself and then accelerate with a rotary motion. Even if the room does not turn on itself it is as if it were turning on itself and any non-bound objects that are inside the room would be pushed outwards against the walls of the room. Incredible! An outside observer sees that the room is still but sees that the objects are pushed outwards and even the observer himself feels a force that moves him away from the room itself. The rotation of ("space_time") generates the expansion of ("space_time"), right where there is the imaginary center of the rotation axis B. Subsequently the same conditions are created that existed before the famous BIG BANG, which already occurred about 13.7 billion years ago. Before the BIG BANG there was no ("space_time"). When it occurs that the ("space_time") does not exist, an external observer could see that time flows at infinite speed and therefore everything becomes probable ... Also the BIG BANG. The extreme dilatation of the ("space_time") that occurs above the pink engine causes a tearing of the ("space_time") and bursts the BIG BANG. The destructive power of the artificial BIG BANG is exactly the same as that which occurred 13.7 billion years ago, impossible to write the number of megatons, it would take many numbers with many exponents on top of each other. I guess, since you posted, you haven't tried it yet? You would have heard it. If true there will be another evidence to support one and only unified field known as charge (Miles Mathis) or aether or ether, whichever you prefer. Nothing is diluted or foamed or bent etc. as fantasised by detached from the reality math-crazy who now dominate physics. There was no and will not be any big bangs or anything of this sort but splashes. 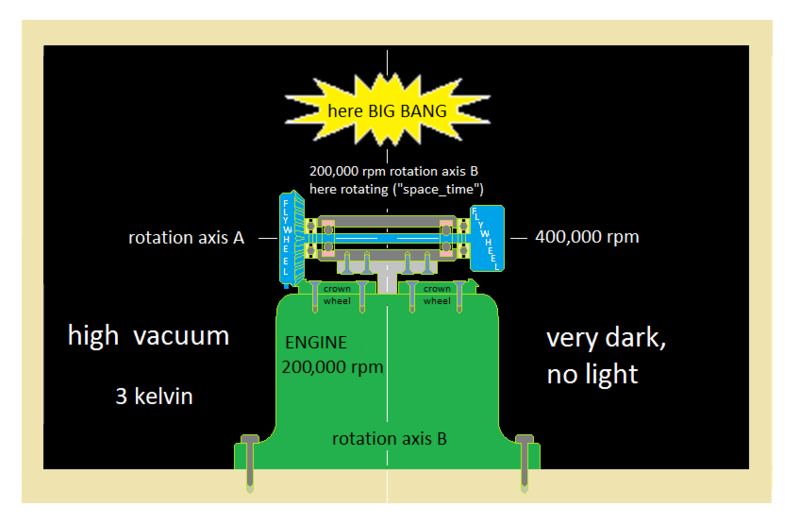 it is possible to make the big bang machine even with an ONLY motor, but in this case the 2 flywheels cannot be of the same geometry. One flywheel must have a crown gear, so a bevel gear pair is required. In this case of a single motor, the brushes are not necessary but there is the friction of the gears. I spent a couple of years in the 60's working on big ultracentrifuges (5 litre volume 140k rpm) and most of the time we were battling at the limit of the materials in terms of strength. From an engineering point of view the only thing you could make a couple of 400k rpm flywheels from, which are themselves being rotated at 200k rpm would be graphene-reinforced unobtanium. The 2 imaginary axes must intersect perfectly otherwise we get dynamic imbalances that are not going well. The effort to make the green engine is remarkable because the gyroscopic effect generated by the pink engine is remarkable. 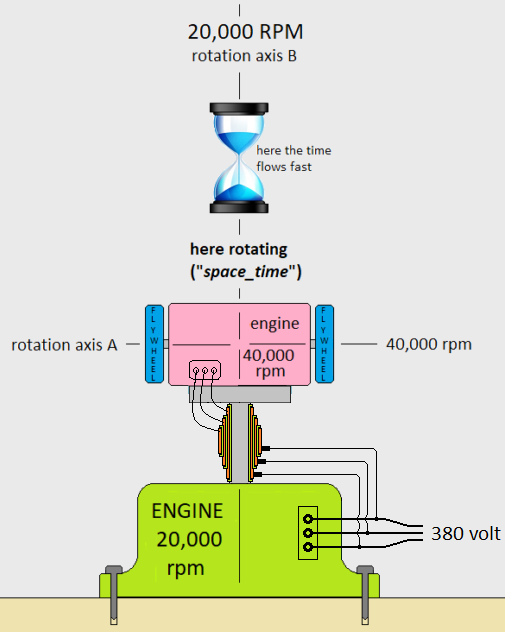 The pink engine has to do 40,000 rpm, instead the green motor has to do 20,000 rpm. We must remember that the gyroscopic effect has the tendency to keep the axis of rotation fixed in space. The torque generated by the green engine should generate heat or potential energy, instead it does not generate any of the two forms of energy, so it seems that the famous law of energy conservation is not respected. This creates an barrier anti-gravity that prevents gravity from passing, so one kilogram placed on a scale weighs will be less than 9.8 newtons. Note: you should not exaggerate to shield the gravity too much because the excessive shielding of the gravity could provoke a tearing of the ("space_time"), the laceration of the ("space_time") could provoke a gigantic explosion. it is possible to make the anti-gravity barrier even with an ONLY motor, but in this case the 2 flywheels cannot be of the same geometry. One must have a crown gear, so a bevel gear pair is required. In this case of a single motor, the brushes are not necessary but the friction of the gears is considerable, would it be more appropriate ? those 2 light yellow pieces are the thrust bearings, whereas the pink ones are 2 normal standard ball bearings. Obviously everything must be dynamically balanced, so the mass of the flywheels must be precise in order to do everything in the center and balanced. Keep these exotic topics in this one thread. Having them spread all over the forum will give us a bad name. If you come up with something more conventional, then you are free to roam. you can also use gardenium which Rossi successfuly utilized in his state of the art devices. In the vicinity of a great mass as planets or stars or black holes, the ("space_time") it is very curved, that is concentrated, and an external observer sees that in the vicinity of those mass the time flows more slowly. The purpose of this time machine is to do the exact opposite, that is, to straighten the ("space_time"), that is, to dilate it. Suppose you need at least 4 days to do a thesis, but you forgot to do it and you have to give it in 5 minutes. How do solve the problem ? You can say that you have forgotten or you need this kind of time machine. With a time machine you can do the 4-day job in just 5 minutes; 4 days have passed for you, but only 5 minutes have elapsed for the others. You would earn a very interesting amount of time. This could also be useful for owners of factories who want to make the most of their slave workers. How is the design of this time machine ? 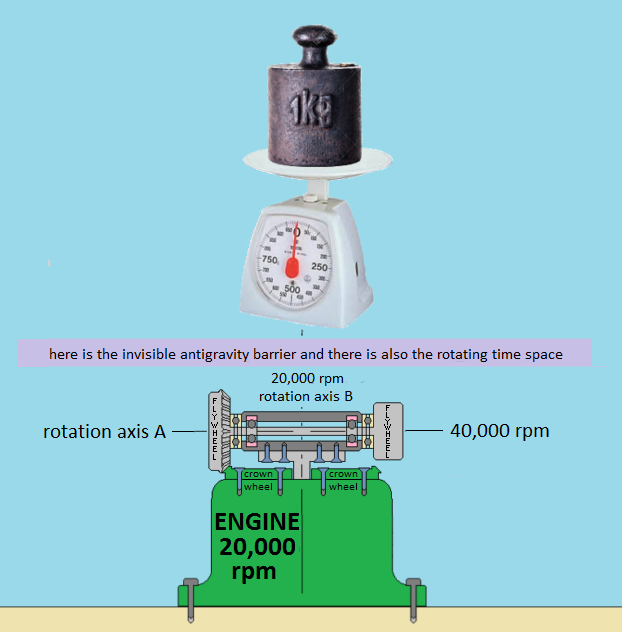 The effort wich the green engine must has to do is remarkable because the gyroscopic effect generated by the pink engine is remarkable. 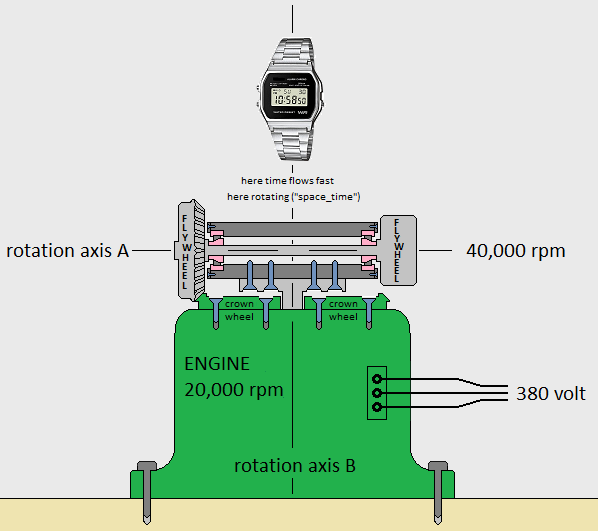 The pink engine has to do 40,000 rpm, instead the green motor has to do 20,000 rmp . In fact: in order for the law of conservation of energy to be respected, it must necessarily happen that the ("space_time") that is above the pink motor must start to turn on itself and then accelerate with a rotary motion. Even if the whole laboratory does not rotate on itself, it is as if it were turning on itself and any non-constrained objects that are close to the machine would be pushed outwards, even an external observer feels a force that drives him away from the time machine. The exact opposite of what happens happens near a large mass like a planet or star or black hole. Note: you should not exaggerate to speed up too much the passage of time, in other words you should not exaggerate to dilate too much ("space_time"); because the excessive expansion of ("space_time") could cause a tearing of ("space_time"), the tearing of ("space_time") could cause a gigantic explosion. It is possible to make the time machine even with an ONLY motor, but in this case the 2 flywheels cannot be of the same geometry.